Thanksgiving is COMING!!! I LOVE Thanksgiving. It is hands down one of my favorite favorite holidays! Family, friends, and food – what else could you ask for? My parents make an AMAZING turkey every year – but if I am being honest, I could do without the turkey. It’s all about the sides for me – stuffing, mashed potatoes, sweet potato, bread, cornbread, mac and cheese… Shoot. I literally just mentioned all carbs. 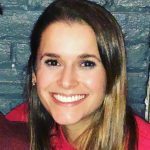 NO WONDER I feel so incredibly full after Thanksgiving! But how can one eat vegetables when there is so much deliciousness around?? 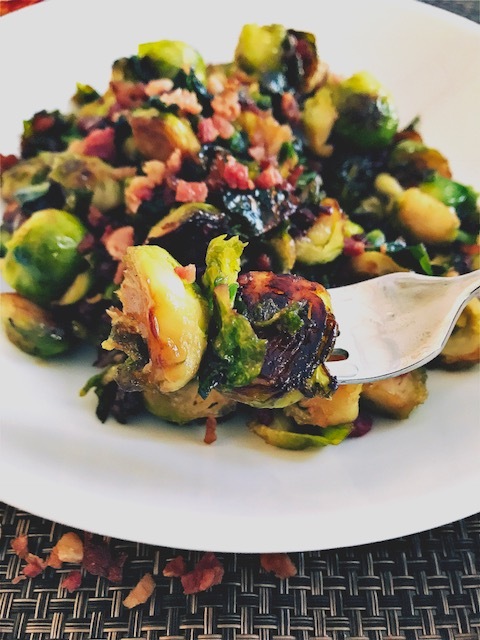 This Thanksgiving there will be at least one vegetable on the table that you do want to eat – Maple Bacon Brussel Sprouts. Okay – so they may be coated in sugar and tossed with my favorite fatty protein, but there is still a vegetable hidden somewhere in there! Brussel sprouts are 100% a controversial vegetable. Some people love them, some people hate them. While we might not be able to agree on whether or not Brussel sprouts are the best or worst vegetable out there – I think there is one thing we can all agree on. They do not smell the best when microwaved. I love brussel sprouts. Baked, sauteed, or even raw – they are such a flavorful and fun vegetable with so much potential. And best of all, they are a great addition to your Thanksgiving table. 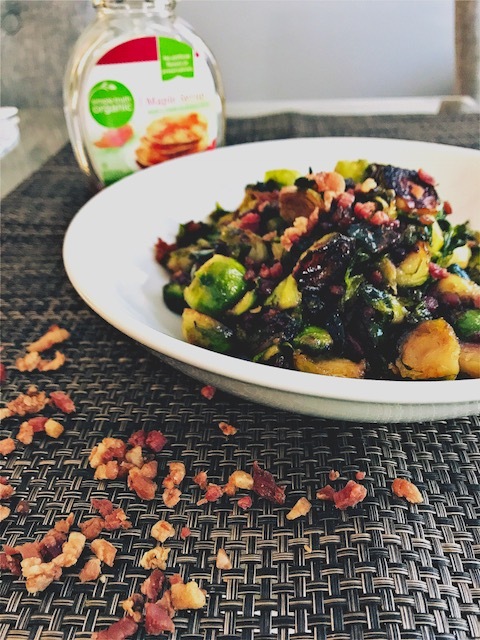 By sauteing the sprouts and bacon in maple syrup you get an almost candied effect. 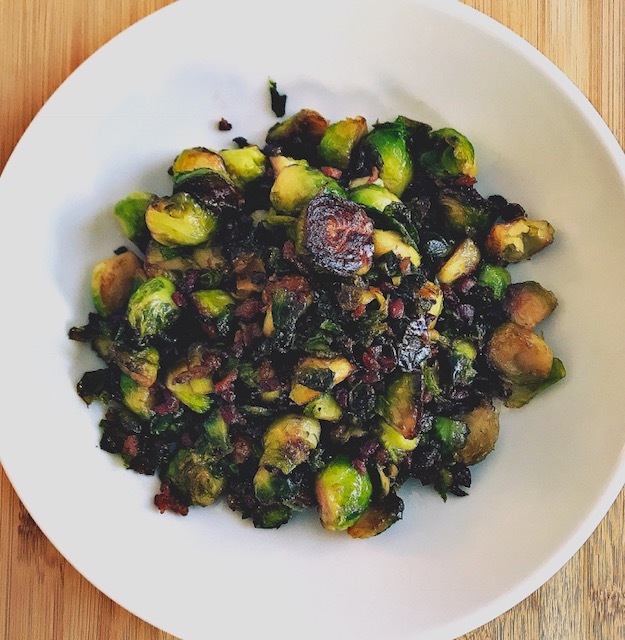 The brussel sprouts become sweet and tender, the bacon rich and crisp. Despite what you may think this recipe is actually a not incredibly awful for you! There is a very delicious, very unhealthy version of this recipe with massive amounts of butter, maple syrup, and bacon. But I chose to keep this recipe version light yet flavorful. I promise you will find this recipe incredibly easy and delicious! Enjoy as a side dish any night of the week – or share with family and friends at your upcoming Thanksgiving dinner! Even those who are skeptical about brussel sprouts will not be able to resist this delicious dish. Prepare brussel sprouts for cooking: Cut off all the brown ends, pull off any yellow outer leaves, then slice each brussel sprout in half. Rinse all halved brussel sprouts in a large collander, then drain excess water. Fill a large saucepan with just enough water to cover entire bottom of pan, heat until boiling over. Add brussel sprouts to boiling water and cover for 2-3 minutes. Once sprouts have begun to brighten in color, strain sprouts in water in collander. Heat 2 tablespoons of butter of low-medium heat until butter is completely melted, add bacon to pan. Cook for approximately 3 minutes to cook off excess bacon fat and flavor the butter. 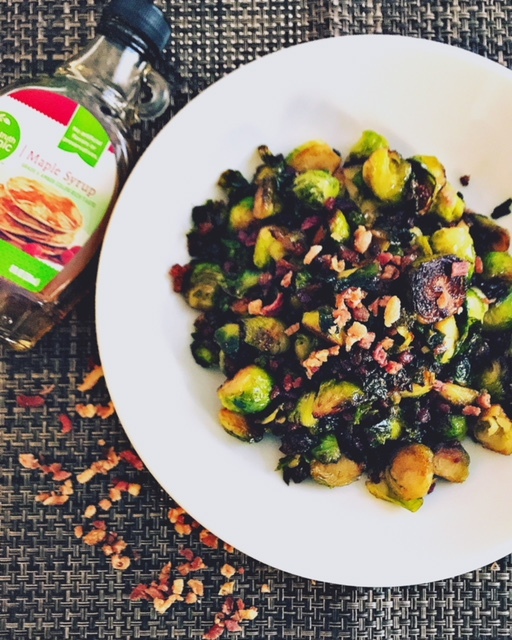 Add brussel sprouts and 3 tablespoons maple syrup to pan - cook over low-medium heat for approximately 20 minutes (use a lid to partially cover), stirring occasionally. Add last tablespoon of butter and maple syrup to pan and cook uncovered over high heat for 5-10 minutes, stirring often. This is the final, and most important step, to make your sprouts crisp and candied! Once brussel sprouts have become browned and leaves wilted (there should not be any leftover liquid syrup in pan), remove from heat and allow to cool slightly. Salt and pepper to taste. Storage: Best enjoyed right away. Refrigerate in an airtight container for 4-5 days if needed. Looking for an even healthier version? Cut the butter and maple syrup quantities in a half. Not a fan of bacon? Try the vegetarian version of this recipe by using chopped nuts (I suggest walnuts or pecans) instead of bacon. 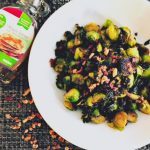 My husband is crazy about Brussel sprouts, they are so underrated! And I’m with you on the Thanksgiving sides. 😉 Turkey is way at the bottom of my list of priorities! Sounds good, I am making brussel sprouts for thanksgiving.